Theodoros Karounos completed the School of Contemporary studies of the City University of New York in 1979, received his B.Sc. in Computer Science in 1983 and the M.Sc. Degree in Information & Communication Systems from Polytechnic University, New York in 1985. From 1984 to 1987 he was employed by IBM, New York, USA, as a Systems Analyst involved in the adaptation and testing of pre-commercial network management tools and the operation of the IBM international corporate data network. From 1987 to 1990 he was a coordinator for systems support and R&D at the Informatics Development Agency of the Greek Ministry of Presidency and Special Advisor for Informatics to the Greek Minister of the Interior. 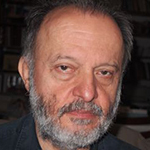 From 1990 onwards he has been actively involved with the National Technical University of Athens, in various posts including managing the R&D activities of the Network and Optimal Design Laboratory – NETMODE, acting as Technical Manager of the telecommunications network of NTUA, and the implementation of GRNET and where he acted as technical co-ordinator. He also represented NTUA at the GUNET policy committee as well as being a member of its technical committee. He has also acted as advisor to the Ministries of Development and Education on information and communication technologies, as well as to the Prime Minister, and e-government coordinator for Greece. He also was the president of the Board of Directors of the Greek Free Open Source Software Society (GFOSS) and a board member of NERIT SA. Currently he is the vice- president of the Board of Directors of the GFOSS.